As a small boy from the fishing town of Whitby one of my memories was to go with Mother, prior to Remembrance Sunday and place a poppy in the wreath at the bottom of Golden Lion Bank. The wreath would be taken out to sea by the lifeboat and placed offshore in memory of those men and boys from the town, lost at sea during the two World Wars. It was then when I was told that our poppy was in memory of one of my Mother’s elder brothers, Terry, who was lost at Sea as a 17 year old cabin boy on the SS “Larpool”, part of Convoy ON-27, sunk by U-boat-208, on the 2nd November 1941 in the North Atlantic. Eventually it became my duty to fulfil the obligation, “Lest we forget”, every November 11th, I place a poppy in our local church or beach to remember Terry, a duty that will eventually be passed on to my children. 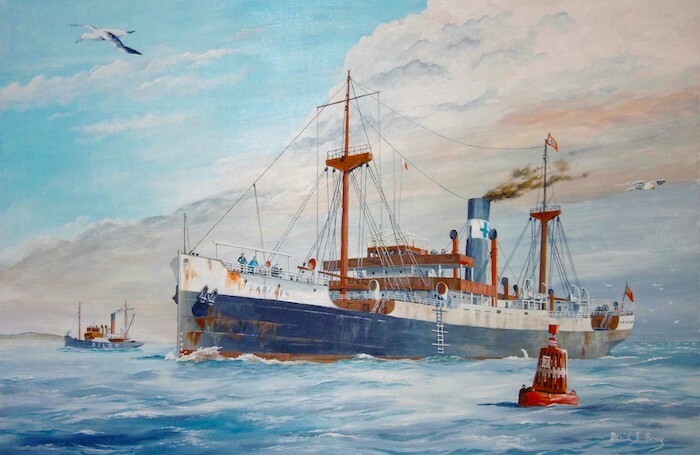 By fate of chance I came across some of David’s paintings and decided that I would commission a picture of the, ”SS Larpool” to become a part of family heritage so that the younger generations of my family would appreciate the sacrifice of the fallen and take that memory forward. The input of research, knowledge and artistic skill that David placed into the painting brought to life something that my grandparents and parents would have loved to have seen. The, SS “Larpool” takes pride of place in our home along side a faded photograph of a 17 year old Terry, proudly sporting his Merchant Navy badge in his lapel. My children and grandchildren are aware of its significance as part of our family history. It will be passed down the line for future generations. I can give no higher recommendation to David for his effort in the painting, giving me the chance to honour the memory of an Uncle that I never met, who like many other gave his all.